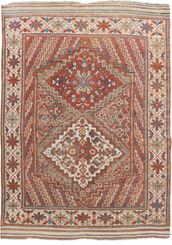 In the province of Azerbaijan, Heriz lies picturesquely on the edge of the Caspian Sea. 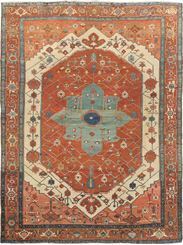 Due to the proximity of the border the Heriz rugs are delightfully influenced by their Russian neighbors, namely in the geometrical designs and bold color contrasts. 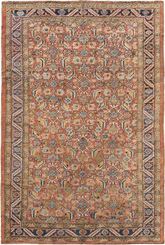 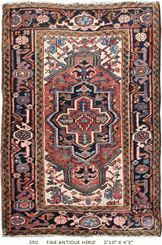 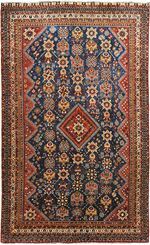 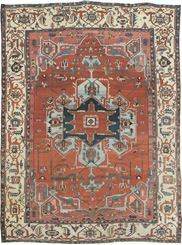 Heriz rugs have long been appreciated by designers worldwide and early examples are sometimes referred to as "Serapi rugs” due to their more primitive execution. 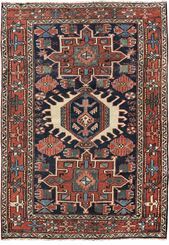 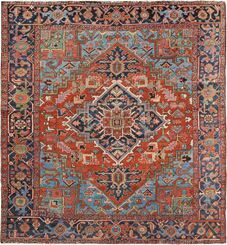 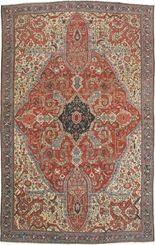 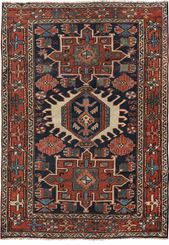 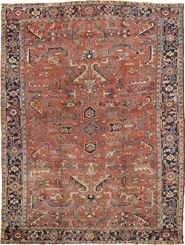 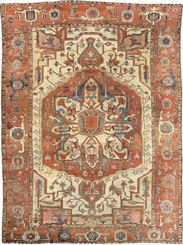 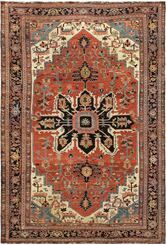 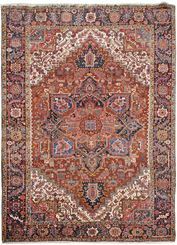 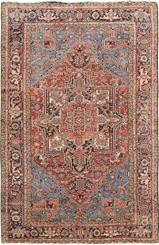 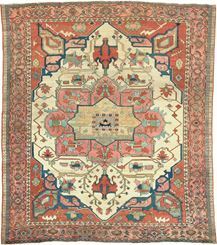 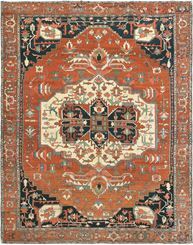 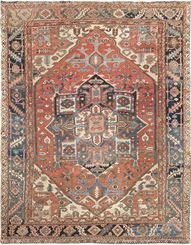 Designs are usually stylized geometric interpretations of early Persian classical carpets containing a center medallion and have been made in sizes ranging from small to mansion. 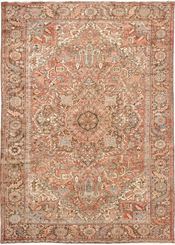 ANTIQUE SERAPI 11' 5" x 14' 4"
ANTIQUE SERAPI 11' 0" x 14' 7"
ANTIQUE SERAPI 10' 10" x 13' 8"
ANTIQUE SERAPI 10' 5" x 13' 8"
ANTIQUE SERAPI 10' 5" x 11' 6"
ANTIQUE SERAPI 10' 0" x 14' 6"
ANTIQUE SERAPI 10' 0" x 13' 0"
ANTIQUE SERAPI 10' 0" x 12' 9"
ANTIQUE SERAPI 9' 10" x 11' 7"
ANTIQUE HERIZ 9' 8" x 12' 10"
ANTIQUE HERIZ 9' 8" x 12' 3"
OLD HERIZ 9' 7" x 12' 10"
OLD HERIZ 9' 7" x 18' 7"
ANTIQUE HERIZ 9' 5" x 11' 10"
OLD HERIZ 9' 4" x 13' 2"
OLD HERIZ 9' 4" x 13' 0"
ANTIQUE SERAPI 9' 4" x 11' 0"
ANTIQUE SERAPI 9' 3" x 12' 2"
ANTIQUE HERIZ 9' 2" x 11' 9"
ANTIQUE HERIZ 9' 2" x 11' 7"
ANTIQUE HERIZ 9' 0" x 12' 0"
ANTIQUE HERIZ 9' 0" x 10' 0"
ANTIQUE HERIZ 8' 10" x 12' 4"
ANTIQUE HERIZ 8' 8" x 11' 5"
ANTIQUE HERIZ 8' 8" x 10' 8"
ANTIQUE SERAPI 8' 6" x 18' 7"
OLD HERIZ 8' 6" x 11' 5"
ANTIQUE HERIZ 8' 3" x 11' 0"
ANTIQUE HERIZ 8' 0" x 12' 0"
ANTIQUE HERIZ 8' 0" x 8' 6"
OLD HERIZ 8' 0" x 11' 0"
ANTIQUE HERIZ 7' 9" x 10' 0"
ANTIQUE HERIZ 7' 6" x 11' 0"
ANTIQUE HERIZ 7' 2" x 11' 0"
ANTIQUE HERIZ 7' 0" x 8' 2"
ANTIQUE HERIZ 6' 5" x 8' 4"
ANTIQUE HERIZ 6' 3" x 9' 4"
ANTIQUE HERIZ 5' 10" x 7' 10"
ANTIQUE SERAPI 5' 7" x 13' 8"
ANTIQUE GASHGAI SHIRAZ 5' 4" x 8' 8"
ANTIQUE GASHGAIE SHIRAZ 5' 0" x 8' 1"
ANTIQUE KARAJA HERIZ 4' 9" x 12' 4"
ANTIQUE HERIZ 4' 8" x 6' 5"
ANTIQUE HERIZ 4' 6" x 6' 0"
ANTIQUE GASHGAI SHIRAZ 4' 4" x 7' 0"
ANTIQUE AFSHAR 3' 9" x 5' 4"
ANTIQUE HERIZ 3' 6" x 9' 0"
ANTIQUE HERIZ 3' 4" x 10' 0"
ANTIQUE HERIZ 3' 4" x 4' 4"
ANTIQUE SERAPI 3' 3" x 4' 3"
ANTIQUE HERIZ 3' 0" x 17' 0"
ANTIQUE KARAJA HERIZ 3' 0" x 4' 3"
ANTIQUE HERIZ 2' 10" x 4' 3"